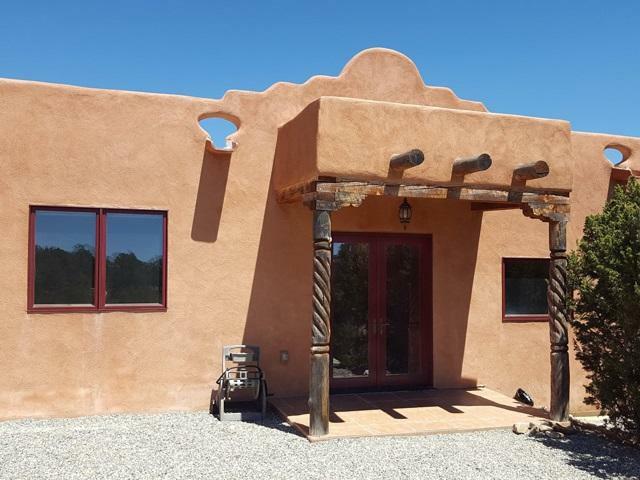 Set against the stunning backdrop of the Sangre de Cristo Mountains, this 3BR/3BA/2216sf home seamlessly integrates traditional Pueblo-style architecture with interior Moorish design elements, including keyhole arches and mosaic work. 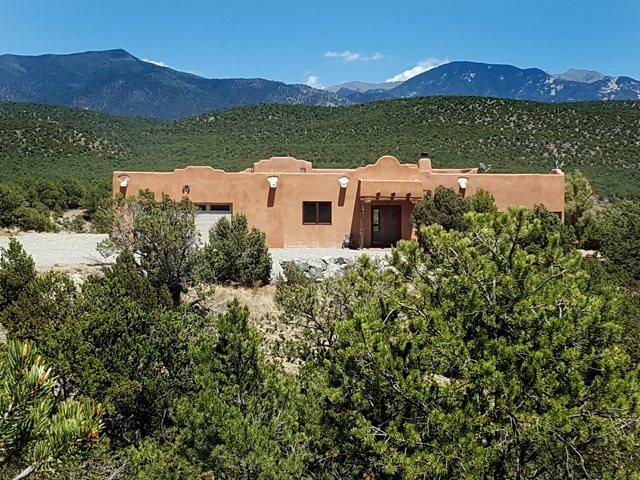 A long private driveway flanked by pions and junipers leads you to this ridgetop homeand priceless mountain views, which are also showcased from inside the house via windows and glass doors. This is truly a five-acre slice of paradise. From the front porch, step inside to a broad entryway, the width of which allows you not only to hang art but also to step back enough for good perspective on it. The entryway can also accommodate bookshelves or even a small grouping of furniture. Through a keyhole arch is the great room, a truly expansive area with large windows that let the outside in. 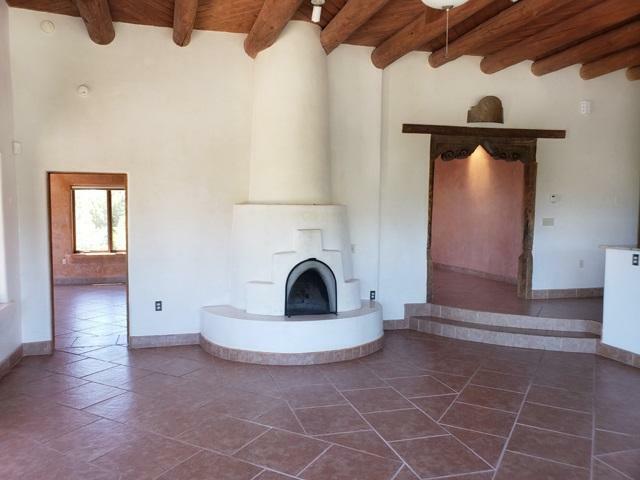 Two steps down in the living room area, which has a kiva fireplace with a lovely step-front surround. Off the great room is one master suite, which has a spa tub, marble tile and beautiful mosaic work in the shower, and a large walk-in closet. At the other end of the great room is the kitchen. Stainless steel appliances include a Jenn-Air fridge with water and ice dispenser, a Bosch dishwasher, and a four-burner Bertazzoni Italia gas stove. There is also a two-sided extra deep stainless-steel sink with disposal. The kitchen has custom poplar cabinetry, a built-in wine rack, a large pantry, and granite counters with ample workspace. Through another keyhole arch are the second master suite and a third bedroom that is also en suite. This guestroom has a nice closet and (behind closed doors) a stacked front-loading LG Tromm washer and dryer. The bathroom has a marble vanity and a shower that includes mosaic tiles. The second master suite is at the end of the hall. It has a glass door that allows exterior access to a small covered porch, a large walk-in closet, and a spa tub with black marble walls and vanity. The bath includes the homes trademark mosaic work on the shower walls. Across the hall from the second master is the attached, heated two-car garage, which has finished walls, viga/T&G ceilings, concrete floors, and windows. Turning the garage into additional living space would be an easy conversion. 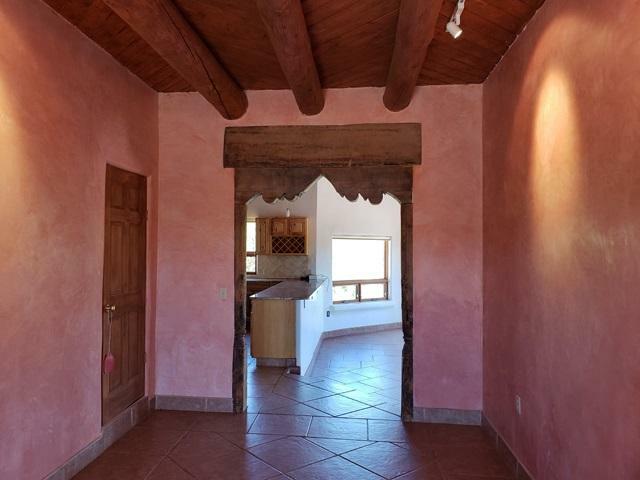 Throughout the home are ceramic tiles, viga/T&G ceilings, ceiling fans, and exotic architectural details. Note the medicine cabinets in the two master baths and the carving above the keyhole arch in the great room. Outside the great room are a shallow covered porch and a large patio. Feel the urge to paint en plein air, lounge outdoors for the sunrise or sunset, or host a barbecue? This amazing mountain home is the place to do thisand so much more.